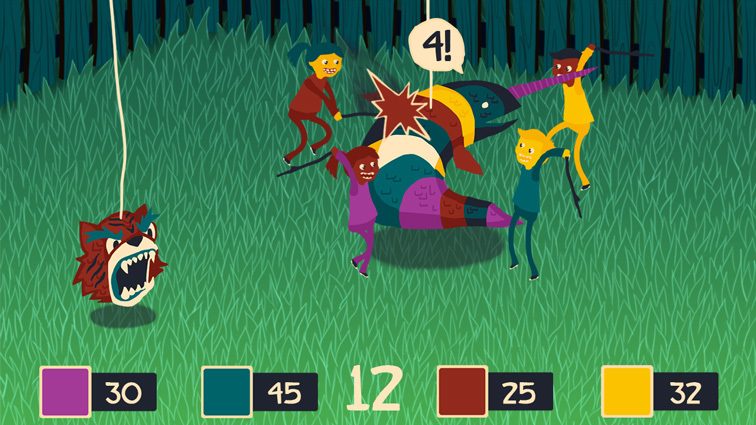 4-player Piñata Slaughterfest. Whomever collects the most candy has the biggest tummy ache. Piñata Slaughta was created at TOJam 7 over the course of a weekend. The team I worked with was completely new to me, but it was a treat working with them. The goal in creating the game was to elicit some form of teamwork between the players which at the drop of the hat would become competitive free-for all. To that end the players must team up to open the piñatas but once their colourful shells have been cracked, it’s every kid for themselves. The game is currently in production but that doesn’t mean I can’t show you some gifs.